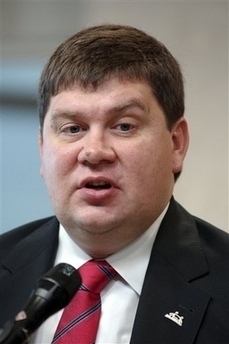 RIGA -- Latvian Prime Minister Aigars Kalvitis announced his government's resignation Wednesday. Kalvitis paid a farewell visit to President Valdis Zatlers and announced his resignation. Meanwhile, Zatlers said he would have talks with three candidates for the prime minister position including Interior Minister Ivars Godmanis and former Finance Minister Valdis Dombrovskis. The president said he would not rashly select a prime minister, but would not delay the selection process either. Earlier Wednesday, Kalvitis told a TV channel his resignation was the only solution to "cool down hot heads." On Monday, nearly 10,000 people from every corner of Latvia staged a large-scale demonstration against the government led by Kalvitis in the capital, Riga. Kalvitis' four-party coalition had come in for harsh criticism after it fired anti-corruption bureau chief Aleksejs Loskutovs on October 16. Kalvitis, in power since December 2004, is the longest-serving prime minister since Latvia's independence in 1991.